Higher interest rates, a heftier foreign-homebuyer tax, and tougher mortgage rules are all being blamed for the correction plaguing the housing market in Vancouver. But BMO Senior Economist Robert Kavcic says there’s another likely candidate behind the correction playing out in Vancouver, where last month the benchmark home price was down 4.5 percent annually to $1,019,600 while sales fell 39.3 percent, according to the Real Estate Board of Greater Vancouver’s monthly report. “It’s probably the case too that the psychology has significantly changed, from FOMO (i.e., when prices were rising at a 30% [year-over-year] clip) to now one of buyers holding back until they see some stability on the price front,” writes Kavcic in a note. “The longer the latter festers, the longer this correction could go on,” he continues. FOMO, or the fear of missing out, likely spurred some homebuyers to purchase property sooner than planned over concerns that they would soon be priced out of the market forever. Now, others aren’t pulling the trigger on transactions so quickly, resulting in just 1,103 homes changing hands on the resale market across Greater Vancouver last month. The condo-apartment market saw sales drop 44.8 percent, while detached home transactions declined by 30.4 percent. Meantime, the benchmark condo price was $658,600, down 1.7 percent from a year ago, and detached home prices nosedived 9.1 percent to $1,453,400. 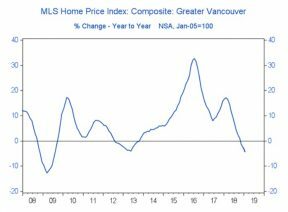 Like Kavcic, REBGV also mentions the trend of buyers stepping to the sidelines in its latest monthly stats report, which showed a massive year-over-year increase of 244.6 percent in new listings this January. “Realtors are seeing more traffic at open houses compared to recent months, however, buyers are choosing to remain in a holding pattern for the time being,” says Phil Moore, the board’s president, in a statement.